Taking care of business: Surbhi Sarna of nVision Medical. As a teenager, Surbhi Sarna was plagued by painful ovarian cysts. After six months of hospital visits and uncertainty, she was finally diagnosed. "I got lucky, and it turned out to be benign," says Sarna, now 28. "But I realized that women's health isn't where it should be." That experience and the frustration she felt over the limited diagnostic options available to women shaped her subsequent academic and professional pursuits. As an undergrad, she studied molecular and cell biology at the University of California, Berkeley, and worked as a clinical scientist at the Stanford University School of Medicine. 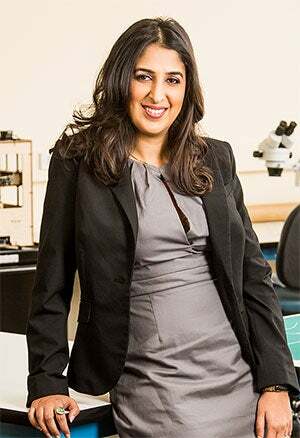 After graduating from Berkeley in 2007, she worked as an engineer for medical-device companies Abbott Vascular and BioCardia. In 2012, armed with roughly $500,000 in seed funding, she founded nVision Medical, a medical-device company that works to improve women's healthcare. In April 2013 nVision closed a $4.5 million investment round led by Catalyst Health Ventures of Braintree, Mass., along with early-stage investment groups Draper Associates, Seraph Group, LMN Ventures and Astia Angels. Darshana Zaveri, partner at Catalyst, which has invested a total of $2.25 million in nVision, was impressed by Sarna's pedigree, engineering chops and determination. "From a technical perspective, she is brilliant," says Zaveri, an nVision board member. "She has a very thorough understanding of how to take technology from concept to prototype to manufactured product. And she has demonstrated a very thorough understanding of clinical need and market opportunity." That opportunity lies in the creation of two catheter-based diagnostic tools, both of which are in the R&D stage. One is for early detection of ovarian cancer, the majority of which is "caught at stage 3 or 4," Sarna says. The other is a microendoscope that gynecologists can use in their own exam rooms (rather than sending patients to radiology for X-rays), allowing them to more easily detect blockage of fallopian tubes, a cause of infertility in women. Among Sarna's biggest expenses: securing patents for her products, paying her seven-person engineering team and testing her products on human tissue samples (made possible by the prevalence of hysterectomies). To keep costs down and to streamline product development, Sarna outsources to two teams of consultants, one working on the ovarian-cancer device, the other on the infertility device. That way, she says, "no one's distracted." "She's essentially a one-man show running a virtual company," Zaveri says. "And she's doing that very efficiently." In January nVision was awarded office and lab space at the Fogarty Institute for Innovation in Mountain View, Calif., a nonprofit that promotes advancements in medical technology. Sarna expects to apply for FDA approval of the ovarian-cancer product and begin clinical trials by the first quarter of 2015, with the infertility product following later that year. If all goes according to plan, nVision could begin selling devices to doctors and hospitals in 2017. Getting a new healthcare product to market--not to mention drumming up support from physicians, patients and insurers--is a long, arduous process. But Sarna is up to the challenge. "For those patients at high risk for ovarian cancer, there is simply no adequate way to catch the disease early," she says. "What keeps me at it is the chance to really make a difference in the lives of these patients."